As a licensed Broker for over 20 years, Charles Hutcheson has a diverse background in the real estate industry. He has been a real estate developer since 2001 and works with buyers and sellers primarily in the residential sector. 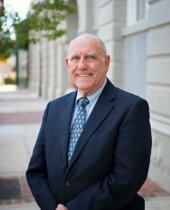 He has served on the Meridian Board of Realtors Grievance Committee and the Mississippi Realtors® Arbitration Committee. Charles is retired from the U.S. military and also served as LEMA director. He has volunteered as the Chief of Suqualena Fire Department and Chief of Lauderdale County Sheriff’s Auxiliary. He enjoys participating in civic organizations including the Shriners and Masons. Charles is married to Marie Hutcheson, and they have 3 children and 9 grandchildren. Let Charles’ extensive knowledge and experience in real estate assist you in buying or selling your home!